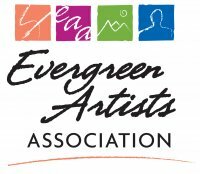 The Evergreen Artists Association was founded in 1958 by artists who joined together providing support and creating an organization for the advancement of the visual arts in our Colorado mountain community. Since incorporation in April 1972, the EAA has promoted appreciation and enjoyment, as well as raised the standards of the visual arts in the mountain area. Of the many activities the EAA sponsors, the best known is the Evergreen Fine Arts Festival which takes place in August of each year. Now rated among the top shows in the nation and noted for its quality, this two day Festival has been an annual Evergreen event for forty plus years. Artists from all over the country participate in this event which is attended by thousands from the Rocky Mountain region. The Evergreen Artists Association is an all-volunteer, nonprofit 501c3 organization formed to support and promote the arts in the Evergreen, Colorado community.